Whenever we have visitors come to Barcelona, requesting the most authentic of food experiences, we have a list of old standbyes that we keep snug in our back pockets. These restaurants are not always the trendiest, nor necessarily hailed as Barcelona’s best, but for us, they embody everything we believe in: value for Euro, fabulous food, centrally located and showcasing either a few good wines, or a long list of lovelies. 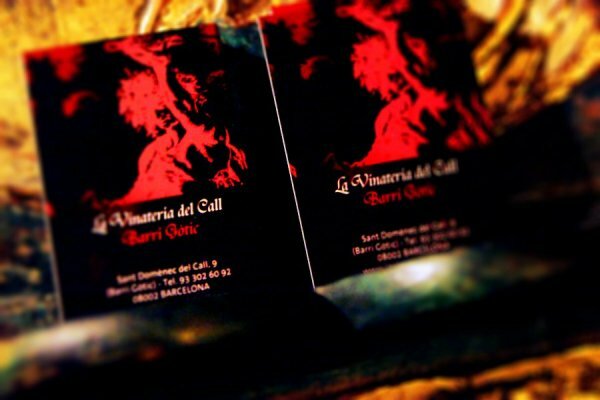 Today we want to share with you one of our regular favorites, La Vinateria del Call. La Vinateria del Call is a vibrant, infundibular restaurant tucked inside the narrow, winding streets of the old Gothic Jewish Quarter. “The Call” – meaning narrow lane”- was the term applied to the entire Jewish settlement that resided in this area during the 12th to 14th century; hence, La Vinateria del Call describes a wine shop in the Jewish settlement of the Call. However, if you’re not from Barcelona, finding this restaurant is much akin to an easter egg hunt, as the Gothic streets are a tangled labyrinth of confusion; made even more frustrating by the massively thick and towering stone buildings that have an uncanny way of blocking any and all GPS signals. But don’t let this detour you, because once you walk into the low ceilinged restaurant encased in dark wood paneling, and rich smells of cured Iberian Jamon and sharp Manchego cheese, your efforts will not be in vain. La Vinateria is best described as a cave, with simple wooden furniture and just enough lighting to avoid swiping your neighbor’s wine glass, which is ironically, perfect. 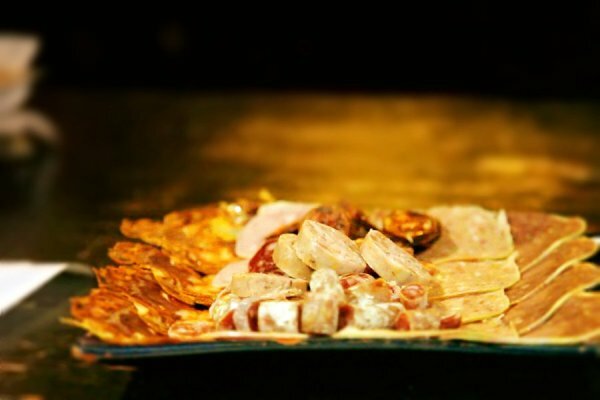 It adds a certain warmth and richness to your evening as you savor cured meats and cheeses alongside an array of speciality dishes. When we first starting going smoking was still allowed, and today with the new smoking ban, the restaurant has become something much more enjoyable. Now, although you can find cured meats and cheeses throughout Spain, what you can’t always savor are the highest quality ingredients sourced from the best producers. As a general rule, we tend to order an assortment of meats and cheeses, followed by key dishes that we’ve fallen in love with over the years. For meats, make sure you order the Chorizo Picante from Soria, one of the few spicy cured meats of Spain; Fuet, a thin, dry sausage made from the pork gut and Longaniza,similar to Chorizo but seasoned with black pepper instead of paprika- both sourced from the town of Vic, located just northwest of Barcelona. An absolute personal favorite is Sobrassada, a soft cured sausage from Mallorca made with finely ground pork, paprika, salt and various other seasonings. As a quasi vegetarian, it’s one of the few cured meats that I’ve sought out whenever humanly possible; followed closely by Cecina. Cecina de Vaca (seasoned and dried cow meat) from Castilla y Leon and Cecina de Ciervo (dried deer meat) from Toledo; and of course, Jamon Iberico de Bellota from Salamanca, are not only some of the most popular meats in Spain, but also the most hailed from La Vinateria. The key is to start with the sampler, then order whichever meat you fancy most, or was not on the plate such as their morcilla (blood sausage with rice). Regarding Spanish cheeses, a source of calcium I could intravenously pump into my system on a daily basis if my hips permitted, La Vinateria has an impressive diversity to choose from. Though we tend to go straight for the assortment platter, containing carefully selected cheeses from their impressive list, I wouldn’t detour you from ordering specific cheeses for curiosity sake, or simply to expand your lactose friendly tastebuds. Of their long list, I might suggest the Tabollet, a ridiculously soft, gleaming white Spanish goat’s cheese from Lleida, Catalonia; and a dry, zesty and slightly tangy goat cheese from Caceras, Extremadura. 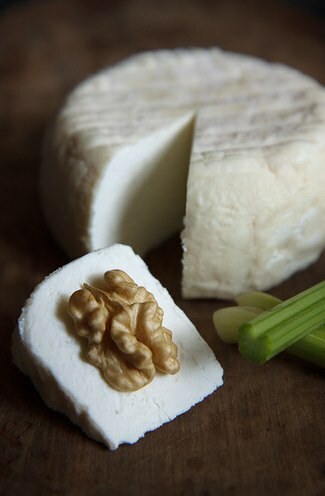 For the Spanish sheep lover’s among you, I’d highly suggest ordering the Torta del Casar from Extremadura, a soft, unctuous and absolutely mouthwatering cheese that will bowl you over with its pungent aroma. Also head for the Andalusian cheese, Papoya, an intensely aromatic cheese, with a soft, firm interior that literally melts in your mouth. And let’s not forget one of the oldest Spanish cheeses, Afuega’l Pitu, an unpasteurised Spanish cow’s milk cheese from Asturias. Pitu describes the experience of the cheese sticking to your palate, and can be found in various levels of curing, as well as in white or red, the latter of which contains paprika. In the end again, it’s best to just order the sampler to start and move on to explore more as your belly permits. For house dishes, ask for their Galician Octopus, a wooden plate piled with small, tender meat sprinkled with a healthy dose of rock salt and paprika. Some find the rock salt to be an overkill, but for those of us who would gladly install a salt-lick in our kitchens if permitted, its seasoned to perfection. The Pimientos del Padron, a Catalan favorite of grilled green peppers from the region of Padron are equally delectable. Finally, let’s not forget the Tortillas de Patatas sampler, which typically comes with the original version (straight potatoes with onions and egg, and the zucchini version. As for wine, I will warn you that it’s been rare that they actually have the first bottle we order. Whether we’re jinxed, or it’s a house prank, we almost always jump through a few hoops before we land on an agreed stocked bottle. However, for many of these, it’s worth the wait. The prices are outright stunning, and don’t worry about not getting value, there isn’t a wine on the list that is overpriced! The only real weak spot is there lack of high quality Cavas, but we can let that go. For us, it’s important to explore and since you are in Catalunya, we suggest asking for a bottle of Catalan white and red. Try something you don’t know, stretch your boundaries, then come back here and tell us what you enjoyed! Finally, a few suggestions to make your experience the absolute best it can be. First, always make a reservation. La Vinateria del Call is a very popular place, and as space is very limited, don’t risk strolling in last minute to come up completely empty-handed. Second, be patient. Though the service is quite good, they are generally under-staffed, leading to long waits if you’re not willing to stand your ground and ask for assistance. Remember to go with people you enjoy talking to, and enjoy the aptmosphere while you wait! For more hints on dining in Spain, go here. Lastly, the best seats are in the very back of the restaurant, where you’re not required to lose 10 kilos before sitting on a stool comfortably. Hence, if you can swing it, request the back room when making a reservation. That said, just enjoy yourself! If you’ve been to La Vinateria del Call, please don’t hesitate to share your favorite treats!